A fusion of HAVER & BOECKER architectural mesh and LED technology from Traxon Technologies, IMAGIC WEAVE® creates with an infinite number of colors individually programmable lighting effects, including full video content on new or existing façades. IMAGIC WEAVE® is available in two different LED technologies, making it adaptable to project specific requirements such as color mixing, angle of radiation and brightness. The system with SMT profiles is ideal for nighttime presentations with broad viewing angles and perfect color mixing. The system with THT profiles is fully suitable for daylight presentations with excellent high brightness. The slim LED-profiles are discreetly installed on the back of the architectural mesh making them nearly invisible from the front. 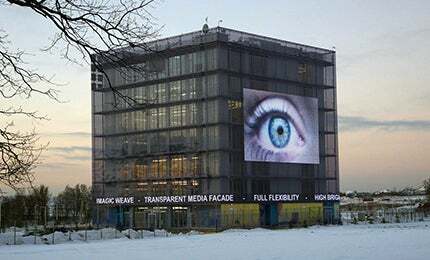 When no content is being displayed, the IMAGIC WEAVE® media screen appears as an elegant stainless-steel mesh façade. Due to the modular structure of the system, façades can completely or partially be designed as a media façade. From a vast range of stainless steel wire meshes and various LED pixel pitches, the transparency of the mesh façade can be varied and adapted to project specific requirements. With the Mobile Action Pad application, the entire control system can be operated via smart phone or tablet PC – at any time, from any location. The completely outdoor rated system of the IMAGIC WEAVE® transparent media façade offers various options for challenging requirements, allowing large-scale landscape media design.